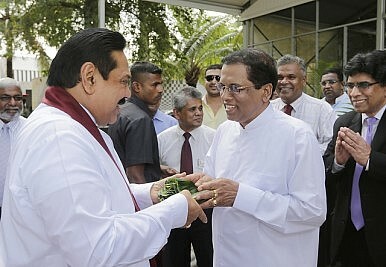 Sri Lanka’s newly elected president has sworn to defeat corruption and reduce dependency on China. Can South Asia’s fastest growing economy continue its winning streak under the new broom? Newly elected President Maithripala Sirisena pledged in his inauguration speech to “lead a social transformation of Sri Lanka” after defeating Mahinda Rajapaksa in the January 8 poll. Sirisena secured 51.3 percent of the vote compared to Rajapaksa’s 47.6 percent, securing a surprise victory despite Rajapaksa’s economic successes and established power base, having ruled the island nation of 20 million since 2005. Sirisena resigned from Rajapaksa’s cabinet in November to challenge his former party leader as an opposition unity candidate, campaigning on a reform platform with backing from a diverse coalition including free marketers, hard-line Buddhists and the island’s main Tamil and Muslim groups. While noting Rajapaksa’s economic successes, Times of India writer Pyaralal Raghavan said the electorate had rejected an increasingly authoritarian trend in Colombo. “The major factor that has gone against Rajapaksa was his penchant for centralizing powers. He extended the two term limits on the presidential office, abolished the post of prime minister and extended his hold on important appointments. Nepotism ruled with close relatives of the president appointed to important posts including that of the defense minister,” he wrote. On Friday, financial markets showed a mixed reaction to the result, with the Colombo All-Share Index rising by 1.4 percent to 7,605, its biggest jump in a month and highest close since March 2011, with traders eyeing potential gains for domestic demand-related stocks. “The election manifesto has been for a consumption-driven economy,” NDB Wealth Management’s Bimanee Meepagala told Bloomberg News, saying he was bullish on financial and retail stocks. Yet while the Sri Lankan rupee closed virtually unchanged against the dollar, bond yields rose as investors weighed the potential impact on inflation. “The climb in yields is unsurprising because this entails uncertainty,” said Mizuho Bank senior economist Vishnu Varathan. “Policy continuity is the first question. The other is whether a new administration would find enough traction to get the institutions working as smoothly,” he added. Under Rajapaksa’s leadership, Sri Lanka posted economic growth averaging 7 percent a year since the end of the civil war in 2009, with inflation declining along with unemployment, poverty and inequality. In its latest country report, the International Monetary Fund noted the 69th-ranked economy’s progress toward developed country status. “Sri Lanka has made notable advances in recent years, and appears to be on its way to joining the ranks of upper middle income countries. Per capita GDP has increased from $869 in 2000 to $3,256 in 2013, and there appears to be an ongoing shift toward higher value added industrial production, as well as rapid expansion of services,” the IMF said. Sri Lanka posted real GDP growth of 7.3 percent in 2013, rising to an estimated 7.5 percent in 2014, although the IMF has projected growth will ease to 6.5 percent this year and next. The challenge facing the new president has been highlighted by ratings agency Standard & Poor’s. In a January 9 statement, it warned of “policy uncertainty” following the overturn of the highly centralized Rajapaksa administration. The new coalition including center-right and leftist parties has “not agreed on a common approach to economic policy…[having been] mainly united by the desire to unseat Rajapaksa. Policy differences are likely to surface when parliamentary elections are called within the first 100 days of president-elect Sirisena’s term, as he had promised,” S&P said. “In the run-up to the elections, Sirisena also promised to expand subsidies and raise welfare payments, which, in the absence of offsetting revenue gains, would jeopardize Sri Lanka’s hard-won progress in reducing its large debt and interest burdens. Romita Das, an analyst at Control Risks, said the new coalition would hamper effective decision-making. Sri Lanka will have to repay or rollover some $2 billion of debt this year, the most since 2005, with the nation already facing the highest interest costs among those rated by Moody’s Investors Service. Sirisena has also pledged to avoid being overly reliant on support from China, which has been the biggest investor and second-largest trading partner under Rajapaksa’s rule. One such Chinese-funded project, a $1.4 billion complex on reclaimed land in Colombo port, would be the nation’s biggest foreign investment ever but likely will be nixed by the new president. In his manifesto, Sirisena vowed equal relations with China, India, Japan and Pakistan, as well as improving ties with Indonesia, South Korea and Thailand. Sirisena has also pledged to “suspend all wasteful expenses and establish a National Economic Planning Council,” stop “mega corruption and wastage,” expose the “true state of state loans” and reassess all mega projects, as well as cutting customs duties on essential food imports and boosting public service pay. Specific changes to food and agriculture are planned, including the creation of a National Land Commission, as well as tax concessions for local investors to create a “knowledge and innovation economy.” Sirisena has also vowed to remove all subsidies on fossil fuel as well as nixing the oil tax. The Ceylon Chamber of Commerce has urged reforms to enhance competitiveness and productivity to boost household incomes, including diversifying exports, encouraging foreign investment, and reforming labor and other sectors to create a business-friendly environment. Meanwhile, new appointments must be made for the nation’s central bank chief, with former governor Ajith Nivard Cabraal quitting after the election result, as well as the key post of finance minister. However, JB Securities chief executive Murtaza Jafferjee said the relatively peaceful election and transition to the new president was a positive sign for the new administration. According to officials, the new president has secured a parliamentary majority essential for his planned reforms, including the establishment of independent commissions to run the police, public service and judiciary and the transfer of much of the president’s executive powers to parliament. With a pledge to create a “corruption-free government within 100 days” followed by elections, the new president has a tight timetable to implement reforms. Delivering on his pledges while managing a diverse coalition and not hampering the nation’s rapid economic growth will ensure the former farmer’s son has little time to savor victory.